Why add something only to have it taken out by your filtration system? Corals actively consume amino acids and other nutrients from their environment. Thus, they benefit from supplementation in the reef aquarium. How can you feed your corals without wasting most of the product in your skimmer? Simple, use HyperKoral. HyperKoral is a new, unique, and revolutionary reef nourishment product, complete with essential amino acids, vitamins, and minerals in the precise concentrations found on coral reefs. 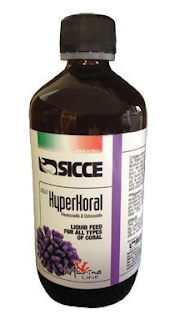 Use HyperKoral as a daily food for your SPS corals. It offers a complete nutrition management system for your reef tank. If your reef system features LPS corals and/or non-zooxanthellate gorgonians that require large amounts of protein, simply combine HyperKoral with living or freeze-dried plankton to provide the extra protein these species demand. HyperKoral is ideal for nano-reefs and smaller tanks without protein skimming. Larger tanks with skimmers retain effective organic waste removal. In either situation, corals fed with HyperKoral grow faster and look more vibrant. HyperKoral contains no preservatives. Our concentrated formulation delivers pure nutrition that mimics conditions found on natural coral reefs. Our proprietary packaging process ensures fresh, full potency product with a long shelf life. Dosage: For the first two weeks, feed 1/4 teaspoon (1.25 mL) per 50 gallons every other day. Subsequently, feed 1/4 teaspoon per 30 gallons of aquarium water every other day.